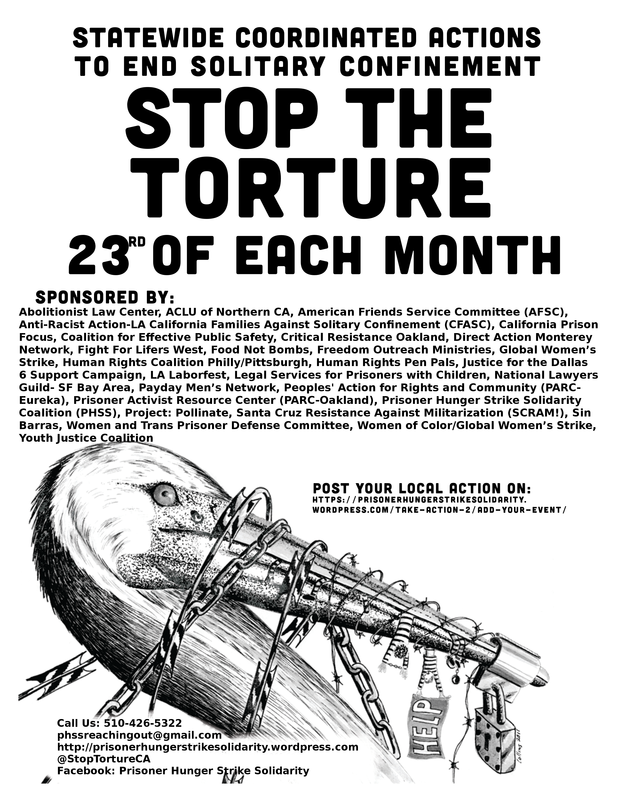 This date emphasizes the 24 hours a day that people are kept in solitary confinement. Submit Your Event to the PHSS Facebook Page and on the Together to End Solitary site. With the support of formerly incarcerated people, folks with incarcerated loved ones, students, lawyers, activists, faith communities and others, Statewide Coordinated Actions To End Solitary Confinement in California grew into the nationwide initiative Together to End Solitary that now links advocates coast to coast in the common goal of putting an end to solitary confinement. There are handouts that can be used by everyone for these actions. PHSS can send out packets of these fliers and handbills by request at phssoutreach@gmail.com. Local groups can hand out additional literature, as well.